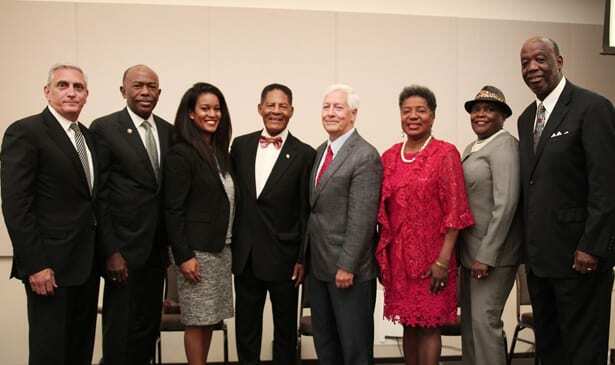 NASHVILLE, TN — Today, the Nashville Branch of the National Association for the Advancement of Colored People (NAACP) solidified their effort, to show unity across multiple generations and backgrounds, by hosting the ‘Coming Together…Unity in Action’ Life Membership Luncheon at the Cal Turner Family Center at Meharry Medical College. During the event, local leaders were recognized for their significant commitment to unifying the Nashville community. Tyler Samuel Soloist at the NAACP Unity Luncheon Program. 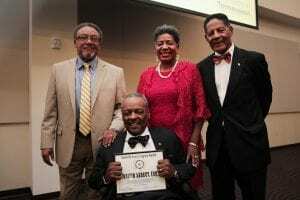 president; seated is Walter Searcy, holding his Legacy Award. 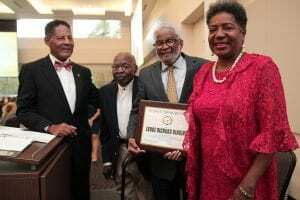 Strong Kimbrough and Gordon Larkins), four (4) Legacy Awards (Rosetta Miller Petty, Walter Searcy, Ben Rechter and Isaac Addae) and one (1) Dr. Charles E. Kimbrough Medal of Honor (Judge Richard Dinkins). President’s Award: This award is presented to a member of the Nashville Branch who has gone above and beyond to support and perpetuate the work of the organization, in the past year. Legacy Award: An individual who creates positive, impactful change and a measurable difference within the greater Nashville community. 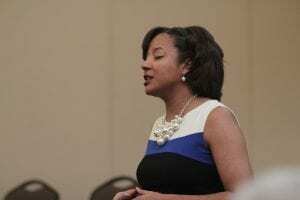 This individual should exemplify the tenets of the NAACP – to ensure political, educational, social and economic equality of rights of all persons and to eliminate racial hatred and racial discrimination. Dr. Charles E. Kimbrough Medal of Honor: An individual who has an established history of dedication to the protection, advancement and/or promotion of all people, while exhibiting leadership and providing inspiration to those around them, within a specific organization or the community at-large. The program included performances by Watson Grove Missionary Baptist Church’s Praise Team, Mr. Miles Slay and Ms. Tyler Samuel. The event garnered significant support from the community. Sponsors included Belmont University, the Nashville Convention and Visitors Corporation, Metropolitan Transit Authority (MTA), Meharry Medical College, Drs. James & Phyllis Hildreth, Nashville Chamber of Commerce, Vice Mayor David Briley, Giarratana Nashville, duGard Communications, R.H. Boyd Publishing Corporation, Nashville General Hospital, DVL Seigenthaler, Bill Freeman, Citizens Bank and American Baptist College.